ANNAPOLIS, Md. 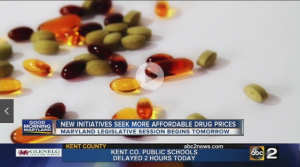 (AP) – Maryland health advocates are scheduled to announce initiatives to make prescription drugs more affordable. Attorney General Brian Frosh and lawmakers sponsoring legislation are set to talk about the proposals on Tuesday in Annapolis, a day before Maryland’s legislative session begins. One initiative would require companies to disclose the basis for high-cost drugs. Another would require companies to notify the public about steep price increases. Legislation also would give the attorney general authority to take action against price gouging. Times Union; WJLA Washington, D.C.; The Washington Times; and others.